This week we are going to talk about the role your gut and the 100,000,000,000,000 (that's 100 trillion) microorganisms that make up your digestive tract have on helping your body absorb minerals and vitamins from food. If you've heard the term good bacteria before, it refers to gut flora (also known as gut microbiota) which lives in our digestive tract. Everything we eat goes through our digestive tract, and the health of our gut flora relates to how much vitamins and minerals our body can absorb from food, it also has an impact on our mental and physical health. Did you know that our gut contains between 70-80% of immune tissue? Foods high in toxins reduce our gut flora's ability to breakdown food and can lead to having a leaky gut, bloating and other intestinal issues. For example, toxins such as preservatives and emulsifiers are added to food to kill bacteria so it can have a longer shelf-life, however, when we consume these toxins it damages our gut flora. Data collected in 2018 shows that a healthy gut has a correlation to good health and lower stress (1). If our gut flora is not as strong as it can be because it's not getting the right foods or because we eat too many toxins, research shows this has a correlation to human brain health (2). What does our gut love? 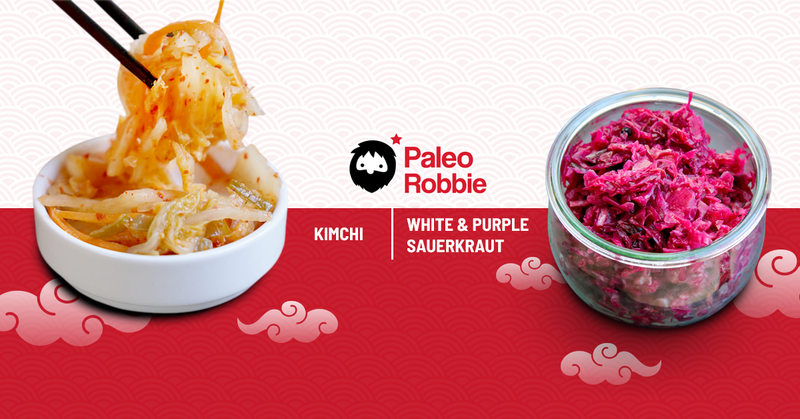 Kimchi and sauerkraut are great for improving the health of gut flora. They're packed with fibre, probiotics and enzymes. These help the body breakdown food into smaller and more easily digestible molecules, which in turn helps the body to absorb more nutrients. Kimich and sauerkraut are great sources of food because they can be added to any meal or eaten as-is without needing to be cooked (they are fermented foods). A small amount of either each day will help improve your gut and the flora that reside there.